Greek ἀπόϕθεγμα something clearly spoken, a terse saying, < ἀποϕθέγγ-εσθαι to speak one's opinion clearly, < ἀπό forth + ϕθέγγεσθαι to utter a sound, speak. 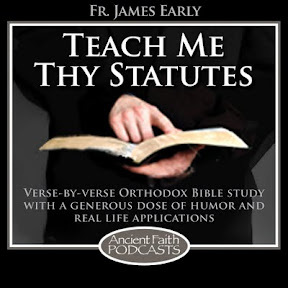 The collections consist of wisdom stories describing the spiritual practices and experiences of early Christian hermits living in the desert of Egypt. They are typically in the form of a conversation between a younger monk and his spiritual father, or as advice given to visitors. Beginning as an oral tradition in the Coptic language, they were only later written down as Greek text. 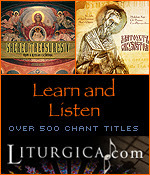 The stories were extremely popular among early Christian monks, and appeared in various forms and collections. 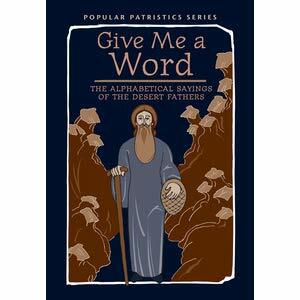 The original sayings were passed down from monk to monk, though in their current version most simply describe the stories in the form of "Abba X said...." The early Desert Fathers and Desert Mothers also received many visitors seeking counseling, typically by asking "Give me a word, abba" or "Speak a word, amma, how can I be saved?" Some of the sayings are responses to those seeking guidance. Interested? Give it a read here or get the very popular "Give Me a Word: The Alphabetical Sayings of the Desert Fathers, PPS52"
THESSALONIKI (TNH) – An appeals court in the northern city of Thessaloniki has upheld the bombing convictions of a monk and the abbot of a 1,000-year-old monastery deemed schismatic by the Greek Orthodox church, and cut their sentences from 20 to 17 years. The decision followed a firebomb attack in 2013 on a court bailiff and his brother trying to evict the monks from a building in Karyes, capital of the Mt. Athos monastic community. Neither man was hurt. The court convicted Antypas, one of the Esphigmenou Monastery’s 118 monks, of throwing firebombs and Abbot Methodios of incitement. Another six monks, sentenced to 10 years as accessories, had their terms cut Thursday by seven months. None were present in court. All were free pending the appeal trial, and are being sought by police. (Romfea) - 17 years’ imprisonment and a fine of EUR 600. This is the ruling of the Mixed Jury Court of Appeal of Thessaloniki to the instigators and perpetrators of the Molotov cocktails attack in July 2013, against riot police, in the buildings of the Esphigmenou monastery in Mount Athos. In a statement issued by the Esphigmenou monastery in Mount Athos, it is noted that “regarding the Molotov cocktail attacks in July 2013 against riot police from the schismatic illegal occupants in Mount Athos. The Mixed Court of Appeal of Thessaloniki, from a lengthy and exhausting two-month process, today unanimously issued its ruling. Methodios – Matthew Papalamprakopoulos and Antipas Fragoulopoulos, who instigated the attack, were sentenced to seventeen (17) years’ imprisonment and a fine of EUR 600, while six members of the illegal occupation, who were accessory, were sentenced to nine (9) years and five month’s imprisonment. The Esphigmenou monastery faces the development calmly, and prays to God give wisdom and prudence to the responsible for the illegal occupation, in order to bring this paradoxical and anti-monastic situation to an end, peacefully and without unnecessary and impassable rivalries. 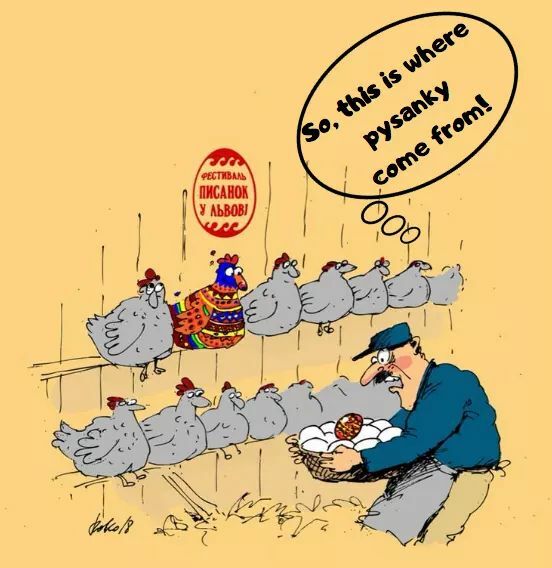 Their tendency to hostility is the reason for the current penalties. 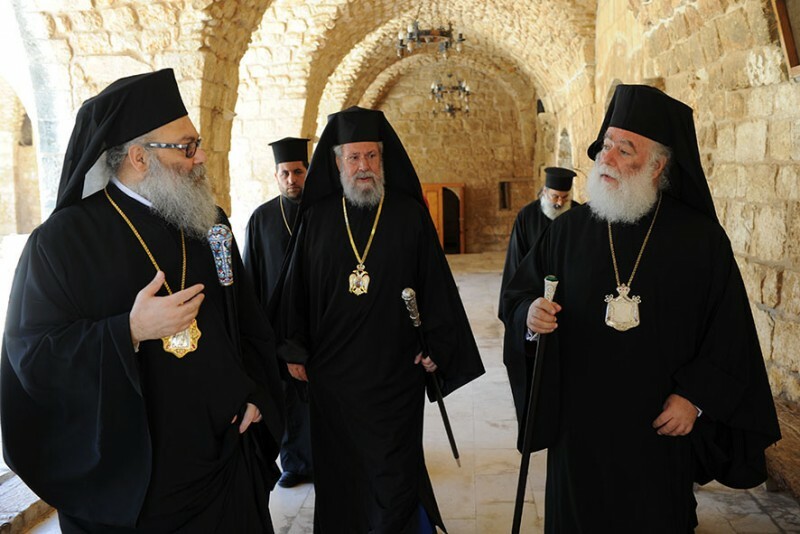 Their Holinesses and Beatitudes, the Primates of the Orthodox Churches in the Middles East, held a meeting that gathered Theodoros II, Patriarch of Alexandria, John X, Patriarch of Antioch, Theophilos III, Patriarch of Jerusalem and Chrysostomos II, Archbishop of Cyprus, at the Cypriot’s Archbishopric Headquarters, on April 18, 2019. In their meeting, they prayed for peace of the whole world, and for the stability of the local holy Churches, especially in the Middle East, the region which is going through many trials. They also supplicated God to establish and strengthen the people of this region, that the believers may continue their Orthodox witness for the Risen Christ, especially in this blessed land on which the feet of Christ and His holy and glorious apostles have trodden, and in the whole world, which is longing for the message of the Gospel and for the hope of His salvation. Their Holinesses and Beatitudes stressed the need to make every effort in order to ensure stability in the Middle East. They discussed the most important ecclesiastical issues relating to the consolidation of the Christian presence in this region and the deepening of cooperation between the local Churches for this purpose. They also appealed to all responsible people to work hard in order to develop this region, by lifting the injustice suffered by their peoples, as a result of war, occupation, and the ensuing economic hardship. In a private meeting between the Patriarch of Antioch and the Patriarch of Jerusalem, Their Beatitudes discussed together in a spirit of sincerity, brotherhood and love, and exchanged views on the issue related to both Churches. They expressed their sincere determination and good intention to overcome these problems in the nearest future, in order for both Churches to reach the sought eucharistic communion. I'm frankly very surprised to see the Patriarchs of Antioch and Jerusalem in a room together. It bodes well for progress on warming relations strained by the Qatar issue. But on the matter at hand - Ukraine - four primates meeting is not a lunch date for coffee, it is a very big deal. (Romfea) - At this moment, a summit of four Primates takes place in Cyprus on the unique topic of the Ukrainian issue and how to deal with it, according to exclusive information by Romfea.gr. At the meeting, the Patriarchs Theodore of Alexandria, John of Antioch, and Theophilos of Jerusalem, participate at the invitation of Archbishop Chrysostomos of Cyprus. There is a possibility, according to ecclesiastical sources, even to issue a joint statement on the issue of recognition of the new autocephalous Orthodox Church in Ukraine. (The Morning Offering) - I should be filled with rage against a brute who could perpetrate such an unwarranted attack against me, especially since I’d smiled at him, just prior to the sucker punch. In my mind I assumed he was approaching me with a request for money, or wanting to know what I was. Since I try, with God’s help, to be kind to everyone, even trying to bring a smile on a strangers face by saying something self-effacing in an attempt to put them at ease, I was totally caught off guard by what he did to me. Instead, I find myself filled with compassion and love for the poor tortured soul who was driven to commit such a heinous act. That a young man would sucker punch an obviously old man, and a stranger to him, is truly hard for me to comprehend. Even more, I am praying for my attacker. The reason is this: Although I am imperfect, and a terrible sinner, I am graced to live a fulfilling and fruitful life, assured of God’s love for me and surrounded by people who love me also. Not so the man who sucker punched me. His pointless act suggests someone filled with loathing for those around him and even more for himself. What inner torment could cause him to lash out at someone who has done him no harm? He is his own victim even more than I am his victim. I know I have forgiven him, but can he forgive himself ? My prayer for him is that he can find the courage to ask God to forgive him. Meanwhile, I covet your prayers. I have been left with a certain amount of hearing loss, with a ringing in my left ear and reduced hearing in my right ear, along with an echoing sound. As a lover of classical music, I pray this will not be permanent. I’m also suffering from headaches, and general body pain. So, in your charity, please keep this old monk in your holy prayers. To the countless people, including three metropolitans, three archbishops, four bishops, two abbots, and a holy abbess, who have reached out to me, I am humbled by your love and caring hearts, and thank you all from the bottom of my heart. 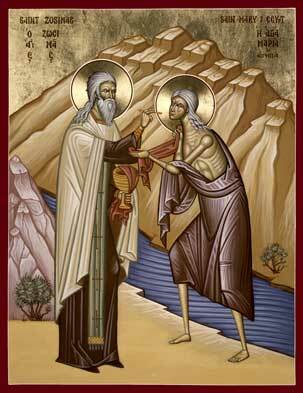 And, as strange as it may sound to some, I am grateful that I was blessed to share in Christ’s suffering and abuse, during these final days of the Great Lenten Journey. I just heard from a Seattle television station that the King County Sheriff Department is trying to get the surveillance video from the gas station so they can air it publicly, with the hope someone will recognize the man. I want him caught, not only that he not injure another person, but that I can have a chance to visit him in jail, and let him know that I forgive him, and that God loves him. Who wants to work for a great Orthodox school? The Saint Constantine School in Houston, TX has several openings for faculty. My children went here for a time and the effects of this education continue to resonate. Maybe you want to help form young minds as well? The Saint Constantine School provides classical, Christian education so that students will grow in wisdom, virtue, and joy. The Saint Constantine School is dedicated to providing a comprehensive formational education in harmony with the Eastern Orthodox Church. Guided by a commitment to the timeless traditions of the Christian Church, mind, and worldview, The Saint Constantine School educates students for the Church, the city of Houston, the United States, and the world. Fr. 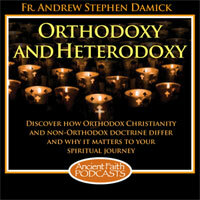 Oleksa "Difficulties with Becoming Orthodox in America"
My wife and I went to France to visit family for our honeymoon. Notre Dame was of course one of the places we visited. As such I've always associated it with the beginning of my marriage and so this conflagration feels much more personal than I would have anticipated. On commenting: Let's leave the anti-French or Catholic bashing for another day. Of late, some people have sent in some donations for the blog (using the sidebar link). As there aren't a steady stream of such, it's always a surprise and always very much appreciated. What does a donation go to? Right now it's blue vestments. So if this were a fundraiser, "Thanks, Mr. Επιμάνικα and Mrs. Поручи Cuffs for your kindness!" (Daily Mail) - A Russian priest has been barred from entering a cathedral and banished to a remote village after his wife won a beauty pageant. Meanwhile Fr. 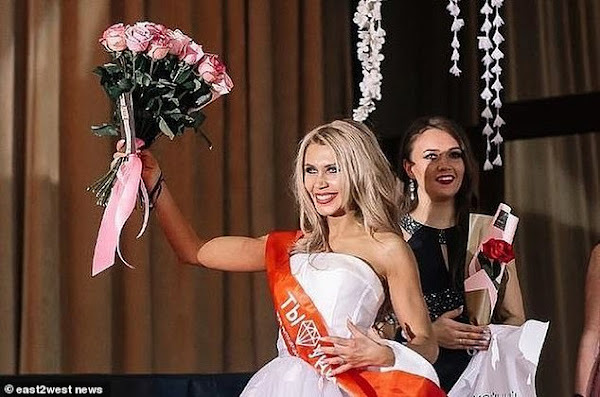 Zotova said his wife faced 'threats, abuse, and other angry messages' - and said he planned to call the police. Mrs Zotova received a barrage of criticism for her 'sinful' behaviour and 'glamour lady appearance' despite no photos of her being risqué. By matushki standards, this opinion is way off. 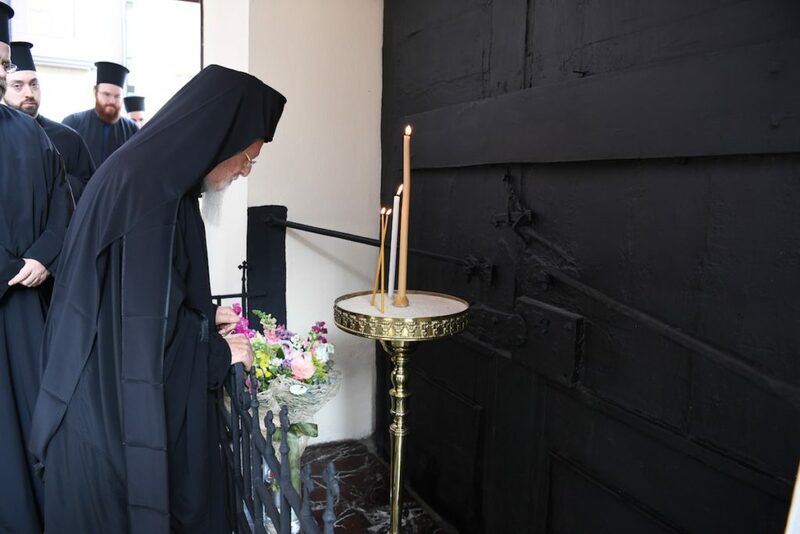 (Basilica) - Ecumenical Patriarch Bartholomew on Wednesday lit a candle and laid flowers at the closed gate of the Patriarchate’s entrance at the Phanar as a homage to his predecessor, Hieromartyr Saint Gregory V, who was hanged in this place 198 years ago. According to the Patriarchate’s press office, His Holiness prayed for a few minutes at the sacred location for the present and future of the Great Church of Christ, for the spiritual advancement of his flock, for protection of the Christian populations and all the persecuted residents of the Middle East, and for the relief of tensions and the prevalence of peace in the world. After celebrating the Easter Divine Liturgy, while still in full patriarchal vestments, Patriarch Gregory V of Constantinople was hanged by the Ottomans on April 10/22, 1821, being left for two days on the main gate of the Patriarchate compound, all by order of the Sultan. 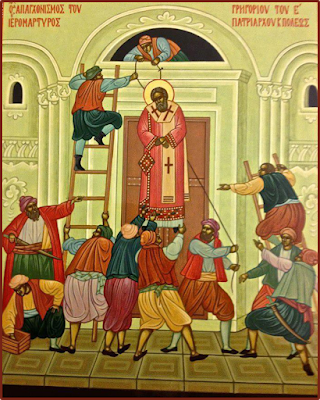 On the 100th anniversary of his martyrdom, Patriarch Gregory was canonized by the Orthodox Church of Constantinople.